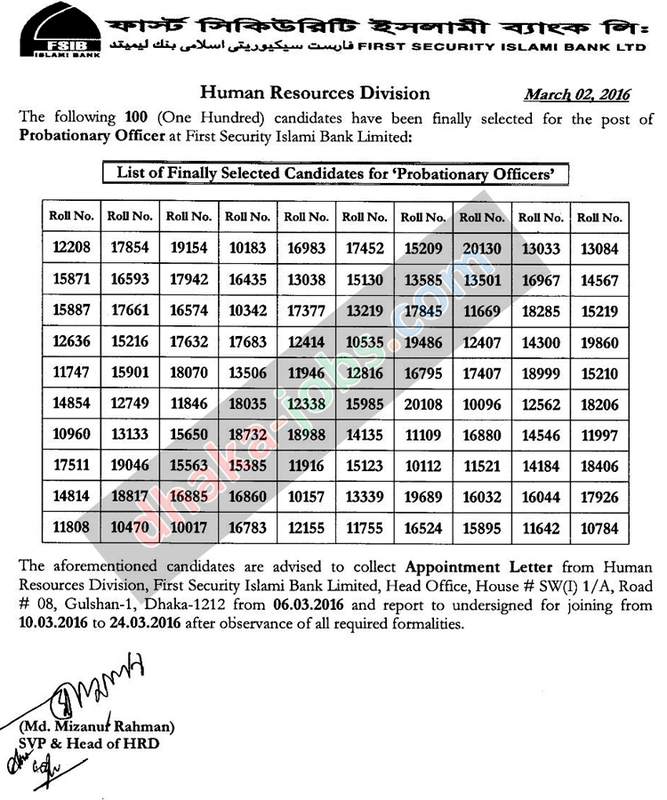 First Security Islami Bank PO Final Result has been found my website https://dhakajobs24.com/. First Security Islami Bank job title is Probationary Officer. 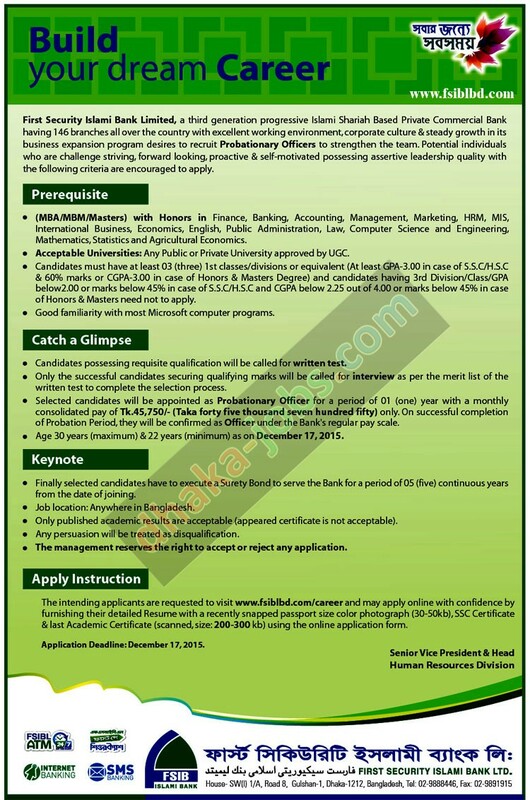 First Security Islami Bank job position Probationary Officer is very attractive remuneration. First Security Islami Bank is a contemporary. First Security Islami Bank is a Upbeat brand of distinctive quality of service and solution that offers a rewarding banking experience as preferred choice of banking partner every time everywhere. As part of its journey to build a winning team, First Security Islami Bank Limited is currently looking for deserving young graduates as Probationary Officer (PO). ■ Job Description: Finally selected candidates have to execute a Surety Bond to serve the Bank for a period of 05 (five) continuous years from the date of joining. Any persuasion will be treated as disqualification. The management reserves the right to accept or reject any application. ■ Education Qualification: (MBA/MBM/Masters) with Honors in Finance, Banking, Accounting, Management, Marketing, HRM, MIS, International Business, Economics, English, Public Administration, Law, Computer Science and Engineering, Mathematics, Statistics and Agricultural Economics. Candidates must have at least 03 (three) 1st classes/divisions or equivalent (At least GPA-3.00 in case of S.S.C/H.S.C & 60% marks or CGPA-3.00 in case of Honors & Masters Degree) and candidates having 3rd Division/Class/GPA below 2.00 or marks below 45% in case of S.S.C/H.S.C and CGPA below 2.25 out of 4.00 or marks below 45% in case of Honors & Masters need not to apply. ■ Compensation and Benefit: Tk. 45,750 per month. ■ How to Apply: Apply to Special Instructions: The intending applicants are requested to visit www.fsiblbd.com/career and may apply online with confidence by furnishing their detailed Resume with a recently snapped passport size color photograph (30-50kb), SSC Certificate & last Academic Certificate (scanned, size: 200-300 kb) using the online application form. ■ Age Limit: Age 30 years (maximum) & 22 years (minimum) as on December 17, 2015. First Security Islami Bank reserves the right to accept or reject any or all the applications without assigning any reason whatsoever. Selected candidates will be appointed as Probationary Officer for a period of 01 (one) year with a monthly consolidated pay of Tk.45,750/- (Taka forty five thousand seven hundred fifty) only. On successful completion of Probation Period, they will be confirmed as Officer under the Bank’s regular pay scale..